Wow! What a busy start to this week!! Monday was not so bad as we just had PT and school. Yesterday I had a IEP meeting with the teacher and specialists at Makenzie's school. We sat down to discuss this year and what we can do to make next year even better! Makenzie LOVES school! She so enjoys being around all of the other kids and activty that go on there! We decussed Makenzie's seating at school and I feel as though she needs better access to the classroom. They have a chair there for her but it doesn't support her well at all. Her chair that we have at home is WAY to big and heavy to bring back and forth to school everyday! The decision was to begin the process of ordering Makenzie her own chair just for at school!!! This is a huge YEAH GOD!!!! 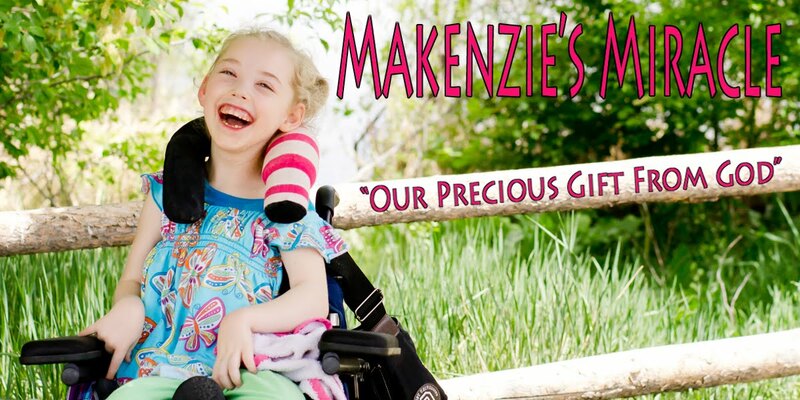 Giving Makenzie the support she needs will help her be able to paticipate and be much more independent in playing with her peers. We will still need to have several more meetings before school gets out for the summer but this is a HUGE start!! I am not sure if I mentioned summer school in anther post but Makenzie will also being attending pre-school this summer from July 19th until the 3rd week in Aug! Today we had an appointment with Makenzie's rehab Doctor. I wanted to talk to her about the MRI she wanted of Makenzie's brain before we did Stem Cells. At the last appointment we talked about this therapy. She has been doing research on Stem Cells and is all for us going!! She wanted to get some pictures of her brain before and then in 6 months or so to try to document an improvement. I understand this from a science perspective but I have really been stuggling with it from the mommy in me! In order to do the scan Makenzie would have to be put completley under and posibily need a breathing tube for the 45 min scan. That is BIG! So today when we went in we talked about why she wanted it. Then the big question..... "If it was your child... what would you do?" She paused for about a minute.... and then with out hesitation said, " I wouldn't do it" WOW!!! Thank You for being so willing to honestly answer my question!!!! Yes, I guess it is still a very hypathedical question but I have great respect for this doctor. She knows the love of a child and the art of medicine!THANK YOU!!!! We then rushed home to be here for speech therapy. Makenzie's therapist came with the Vice president of Dynavox (one of the leading brands of talkers) I had the chance to pick his brain for nearly an hour about what their products had to offer in respect to what Makenzie's needs are! I learned a TON!! We just keep getting closer every day to find the right device for Makenzie!!! On that note..... Mother's day brought a very unexpected blessing! I got a call from Makenzie's Grandma. She was so excited and told me she had something amazing to tell me. OK, I am sitting down.. now I am ready.... ok not really... I was in SAM's club holding Makenzie with one hand on my hip while trying to push the cart and pick up 2 gallons of Apple juice, while talking on the phone.... yes it was a laughable site.... go ahead you won't hurt my feelings... laugh away!!! She had called to tell me about a response to a prayer request she had made to her church. A couple had brought her a LAPTOP COMPUTER for Makenzie!!!! HOLY COW!!! Is God not GREAT or what?!!!!! THANK YOU!!!!! THANK YOU!!!! THANK YOU!!! This mean SO MUCH! Now on to the Fundraiser!!! WOW!!!! We are SO CLOSE!!!!! I know God will provide and we continue to trust in His continued faithfullness!! To all of you that have sent donations THANK YOU!!!!!! THANK YOU!!!!!!!!! THANK YOU!!!!!!! If you sent a donation to Makenzie's Benefit account and would like us to know who you are please e-mail us at makenziesmiracle@comcast.net! We would LOVE to thank each and every one of you personally! Thank You all for your Love and Support!! With out you I am not sure where our family would be right now!!! Most importantly.... Keep PRAYING for Makenzie!! Believe... Prayer WORKS!! !